Description Totally confident in his play, Harry's philosophy is "If I play my best game, I'll win!" 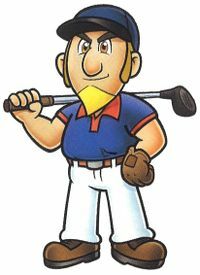 Harry is a human golfer in Mario Golf for the Nintendo 64. This is the only game that he appears in, thus making it his only playable appearance. He has a long drive and a shot that draws, similar to Mario. There is also a Harry in Mario Tennis; however, that is a completely different character. Harry is the fifth character to be unlocked via the character match. Harry wears a blue shirt, blue hat and white pants with brown shoes. Harry also has a blonde goatee and hair, and his name may even be a pun on the term "hairy". Harry is also a very serious golfer, as he gets angry with bogeys, grunts when he gets pars, and is only "okay" with birdies. This page was last edited on February 16, 2019, at 04:39.